The Awutu-Senya Constituency branch of the opposition NDC has strongly condemned the Former President and Founder of NDC for interfering in the Constituency activities. The angry Constituency Functionaries have warned Mr. Rawlings to stay off the activities of the Constituency especially the impending Parliamentary Primaries in which three people have filed their papers to lead the NDC. The aspirants are; the Assemblyman for Awutu, Moses Acquah, former MP, Alhaji Baba Lamin and incumbent MP, Hanna Tetteh Kpodar. The former President and Founder of the NDC last Saturday, was in the Awutu-Senya Constituency and told the party executives to maintain the incumbent MP because she is a good material and better position to articulate the concerns of the Constituents in parliament. Party Executives present were extremely unhappy about the comment of Mr. Rawlings and criticized him for wanting to impose a candidate on them. The Parliamentary Primaries in the Awutu-Senya Constituency is the first democratic means in which the NDC is electing a Parliamentary Candidate since the return of Multi-party Democracy in 1992 and this has generated unease tension among the party delegates. Speaking to Peace FM, the branch Chairman of the Kasoa New Town NDC, Alhaji Yusif, strongly criticized the former President for wanting to impose an unpopular Candidate on the Party. He said the incumbent MP, Hanna Tetteh Kpodar, knows that she has lost touch with both the Constituency Executives and Party followers and in trying to redeem her unpopularity brings Rawlings to change things around. 'We want to tell the former President and those who wants Hannah Tetteh Kpodar as the Candidate for Awutu-Senya that the Party does not want her' Alhaji Yusif stated. The visit of Mr. Rawlings in which some constituency executives were not aware, is an attempt according to Alhaji Yusif by the incumbent MP to salvage her sinking image among Party members. He warned that if former President Rawlings and Party Executives in Accra succeeds in imposing Hannah Tetteh Kpodar on them, then he (Rawlings) and those in Accra will come and vote for her. The incumbent MP is struggling to keep her parliamentary ambition alive as former MP, Baba Lamin appears to enjoy support from Party Members in the Awutu-Senya because of his good human relation. 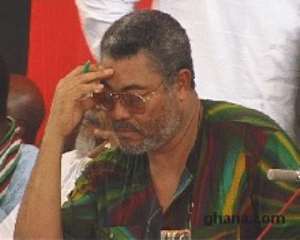 Alhaji Yusif also asked former President Rawlings to be mindful of his activities in the run-up to the December general elections in order to undermine the chances of Prof. Mills and the NDC.